Islami Bank Job Circular 2018. IBBL Job Circular 2018 has been published. Islami Bank Assistant Officer Job Circular 2018 First time publish official website http://www.islamibankbd.com/. Bangladesh Islami Bank One of The Best Islamic Shariah-based Commercial Bank in Bangladesh. Islami Bank Job Circular 2018. IBBL is Looking for Smart, Ambitious, young, confident and enthusiastic in the post. Islami Bank Limited every year publish new job circular, this time publish new Job Circular 2018. IBBL JOb Circular Publish 9th May 2018. Post Name: “Assistant Officer Grade-II (General), Assistant Officer Grade-III (Cash)”. Interested Candidates Application Method Online. Online Application Will Start From 12 June 2018. Candidates must have submit a valid e-mail Address. Candidates must Submit scanned passport size photograph (100 kb) & signature in every stage of the recruitment process. All Eligible and Interested Candidates have to apply Online via career.islamibankbd.com Website. Islami Bank is The Major Shari’ah Based Bank and largest Private Commercial Bank in Bangladesh. Now publish IBBL 5 Category Job Post. If you want to be interested Islami Bank job you can apply for this post. Islami Bank is one of the best and largest banks in Bangladesh. 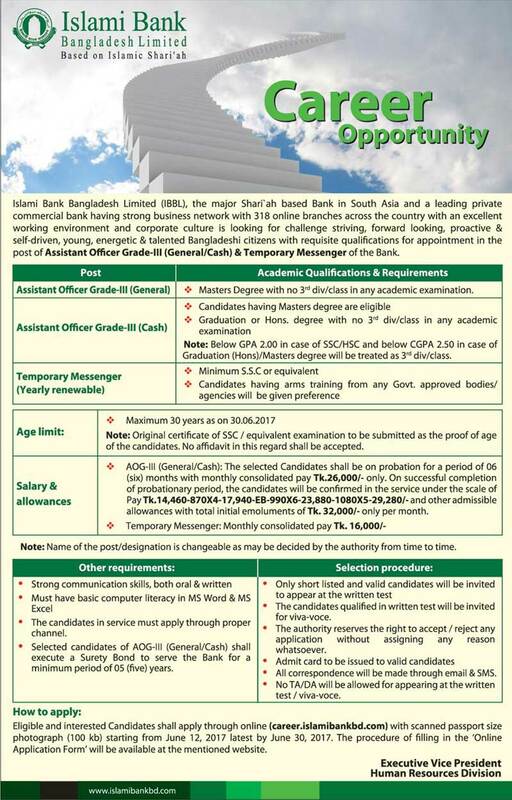 Islami Bank Bangladesh Job Circular 2018. Bangladesh all Govt. Bank and Privet Bank job Circular in here.